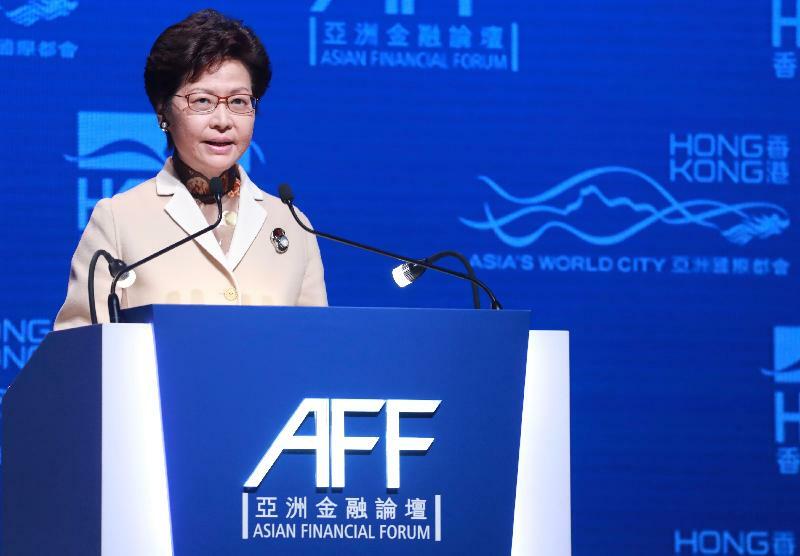 Following is the speech by the Chief Executive, Mrs Carrie Lam, at the opening ceremony of the Asian Financial Forum today (January 15). Good morning. It gives me great pleasure to welcome you all, to this year's Asian Financial Forum, for the first time in my capacity as Chief Executive of the Hong Kong Special Administration Region. I would like to first express my heartfelt gratitude to our distinguished speakers, in particular ministers, heads of regulators as well as leaders of multilateral organisations, for gracing this event with their presence. 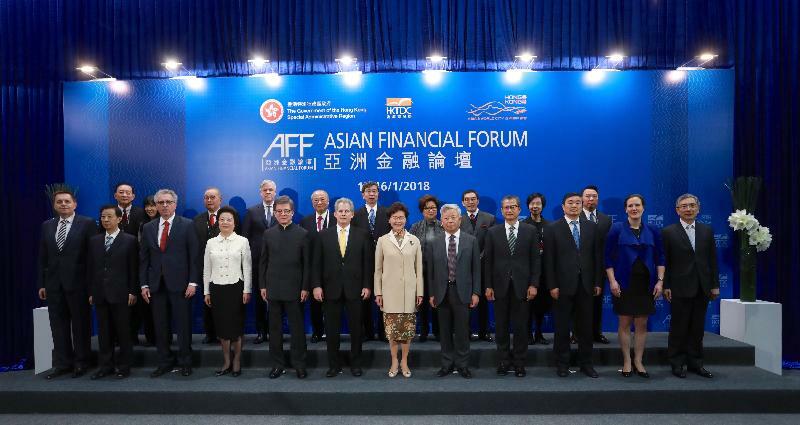 Eleven years ago, when the Asian Financial Forum was first conceived and put into action, we were driven by the vision to leverage on Hong Kong's unique position and advantages to build a lasting platform where policymakers, leaders, investors, regulators and entrepreneurs could share ideas, articulate visions, and focus attention on areas of priority in the world of finance. We have remained true to this vision since then. The Asian Financial Forum is now widely acclaimed as one of the most popular and important international financial forums. I am proud of our achievement, thanks to the joint efforts of the Hong Kong Trade Development Council and my finance colleagues, and I also would like to thank you all for your support and participation. "Growth" and "innovation" are the two key words underlying the theme of this year's Forum. It is opportune that growth is finally taking a firmer foothold on a global basis, in particular in this region of the world. Global economic growth picked up visibly in 2017, with improvement in most major economies. Amid the improving global economic environment, Asia is taking centre stage in terms of growth and potential. Asian economic growth has persistently outpaced other regions over the past two decades, signifying sound fundamentals and promising growth potential. Asia's mammoth population, reaching four and a half billion by now, coupled with an expanding middle-class marked by rapidly rising purchasing power, is driving the world forward, with huge economic potential to be tapped. Building on economic success, Asia's businesses have also been thriving. Of the top 500 global companies ranked by Fortune in 2017, 194 were based in Asia, up around 56 per cent from a decade ago. Zooming in further within Asia, the impact, scale and importance of China for the continent and the whole world speaks for itself. The rapid development of the Mainland economy is instrumental in steering global economic growth. Since the reform and opening-up in 1978, the Mainland economy has seen an impressive pace of growth, averaging 9.6 per cent per annum. Hong Kong is both a contributor and beneficiary of the Mainland's reform and opening-up. As this year is the 40th anniversary of this national strategy, my Government is planning a series of activities to reflect on our past successes and to look forward to the future. As a US$12 trillion economy, the second largest in the world, the Mainland is still growing at a pace significantly higher than most major economies, achieving a remarkable growth at 6.9 per cent in the first three quarters of 2017. In addition, in his report to the 19th Party Congress, Secretary General Xi Jinping has laid out a clear vision for future economic growth, with emphasis on quality, inclusiveness and shared benefits. As China has embedded and integrated itself into the world economy, creating a symbiotic relationship of a scale and complexity unseen in history, the roles of Hong Kong and the functions we could uniquely offer as an international financial centre, underpinned by "One Country, Two Systems", have taken on increased relevance and importance as never before. Thirdly, Hong Kong is a premier centre for asset management and risk management. The combined fund management business of Hong Kong has tripled over the past decade. Funds sourced from overseas investors accounted for 66 per cent of the total in 2016, signifying our attractiveness as an international asset management centre. Ladies and gentlemen, in an era of growth, a rising tide lifts all boats, but we cannot afford to be complacent. We must set our vision far and wide, guided by strong leadership and a coherent strategy for consolidating our strengths and opening up new horizons. It is for this reason that I decided to set up a Financial Leaders Forum in Hong Kong at the beginning of my term. Chaired by the Financial Secretary, the forum comprises the most senior and important leaders in the realm of financial services in town. Since its inception in August last year, it has provided strategic guidance over a number of issues, including key changes to make Hong Kong the preferred listing platform for new economy enterprises. In pursuing growth, we will never lose sight of the need for robust and transparent regulation that is of the right touch and in alignment with international best practices. Sustainable development must be underpinned by regulatory oversight to ensure market order and, where necessary, clamp down on illegal activities. Our key regulators – the Hong Kong Monetary Authority (HKMA), the Securities and Futures Commission (SFC) and the Insurance Authority (IA) – will remain vigilant while facilitating growth and development. There is a delicate balance to be struck between development and regulation, and I believe our regulators have charted forward along the right direction. As a city with no natural resources, innovation is deeply ingrained in the DNA of Hong Kong. We have a cherished tradition of innovating into prosperity out of physical constraints by taking full advantage of circumstances - ever-changing as they may be - favourable to our economic development. "Innovation", the second key word of this year's theme, must be seized upon to unlock the full potential of the gains from growth and ensure that Hong Kong stays ahead and remains competitive in the wealth creation process of China's growth. Knowing that connectivity with the Mainland capital markets is crucial to the further development of Hong Kong as an international financial centre, we, with the support of the Central People's Government, have built up mechanisms one after another for deepening connectivity. Starting from the Hong Kong-Shanghai Stock Connect in 2014, the Hong Kong-Shenzhen Connect in 2016 to the Bond Connect in 2017, coupled with mutual recognition of funds, Hong Kong has showcased our unique role under "One Country, Two Systems". Since their inceptions, the cumulative transactions through the Stock Connect conduits in the Mainland totalled more than RMB4.6 trillion, while those in Hong Kong amounted to HK$3.9 trillion. In this process of wealth creation, Hong Kong not only strengthens our status as the prime gateway for overseas investors to enter the Mainland financial markets, but also brings forth immense mutual benefits for both the Mainland and the rest of the world. What's more exciting and of a grander scale is the concept of the Guangdong-Hong Kong-Macao Bay Area, covering Hong Kong, Macao and nine of the fastest growing cities of Guangdong Province including Guangzhou, Shenzhen and Zhuhai. With a population of 66 million, roughly the size of the United Kingdom, and collective GDP at US$1.36 trillion, akin to that of South Korea, the economic potential that could be unleashed from increased connectivity and integration within this region is beyond imagination. Hong Kong has the expertise and experience in financial, professional and business services to assist Bay Area companies in their pursuit of international expansion. At the same time, our unparalleled knowledge of the Chinese market, and our deep economic connections with both the Mainland and the rest of the world, best equip us to work with our partners to tap the opportunities in the Mainland's vast market and in particular the Bay Area. Added to the Guangdong-Hong Kong-Macao Bay Area are the opportunities of the Belt and Road Initiative. The Belt and Road Initiative will provide a new window of opportunities for us to further deepen our role in connecting the Mainland with other economies along the way. As Asia's international financial centre, Hong Kong has the experience, expertise, international connections and deep liquidity to serve as the fundraising and financial management hub for different kinds of mega projects. Hong Kong offers a great variety of financing avenues, from IPOs and loan syndication to bond issuance. One important aspect of Fintech is that it lowers physical barriers and limitations for serving clients beyond borders. For instance, cross-border payment and money transfer using Fintech could ensure speedy and secured transactions. Some stored value facility operators in Hong Kong are already offering instant global money transfer services, allowing clients to send money to a number of countries, including some along the Belt and Road, with a few taps and swipes on a smartphone. Apart from cross border payment and money transfer, blockchain technology could also potentially come into play in the Belt and Road Initiative. We are working on it and making good progress. Seven banks in Hong Kong have decided to develop a trade finance system named the Hong Kong Trade Finance Platform (HKTFP) to digitise and share trade documents and automate processes. Simply put, it means faster and more efficient processes with lower cost, as well as reduced risks and frauds. The HKMA is already in discussion with the Monetary Authority of Singapore on building a cross-border infrastructure to connect HKTFP with a similar trade platform in Singapore. On the front of supporting start-ups, Hong Kong Cyberport has launched a dedicated Fintech co-working space, Smart-Space FinTech. Cyberport's incubation programme also provides designated support for 150 Fintech start-ups by year 2020. In addition, we have launched the HK$2 billion Innovation and Technology Venture Fund and are inviting private venture capital companies to join hands with the Government to invest in technology start-ups. Ladies and gentlemen, in the face of accelerating and revolutionary technological changes, it becomes all the more important for stimulating and thought-provoking discourse through a platform such as the Asian Financial Forum. This Forum will give you a full plate of ideas to chew over. But, to me, the fact that we would be challenged to re-think the unthinkable and reflect on our accepted ways of thinking is equally important. As the great economist John Maynard Keynes so aptly said, "The difficulty lies not so much in developing new ideas as in escaping from old ones." With these remarks, I would like to extend my warmest welcome to you all again, and wish the Forum a resounding success. To our guests from overseas, I also wish you a most enjoyable stay in Hong Kong. Thank you.